All thermostats are not created equal. Stant thermostats offer superior, consistent performance that begins at the heart of their design. 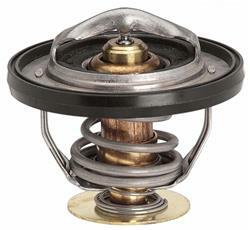 The ELAC heat motor, with its unique properties, provides a precise response to your vehicle's cooling system needs. Powered by a precisely formulated thermal-responsive wax pellet in a heat-conducting copper cup equipped with a stainless steel piston, the heat motor is 100 percent calibrated to ensure quality and performance. Stant encases the motor in a stainless steel assembly with a self-cleaning, self-aligning valve, flange, bridge, and spring for a securely sealed unit that will keep your engine temperature within OEM specifications. All thermostats are not alike; so, when you want a well-engineered product, look for Stant thermostats.